Motorized Shades are the process of having all your shades (ranging from roman shades to solar shades) rolling up and down via a motor or remote control. This process gives you easy access to roll your shades up or down with a click of a button. 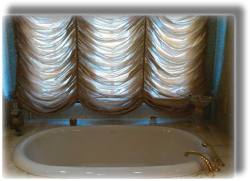 Bettertex provides motorized shades for most custom window treatments. The motors are hidden behind the fabric and can lift weights of up to 600 pounds with ease. You’ll soon realize the benefits of motorizing your interior window coverings because you will use them more often. That means more energy efficiency and better sun protection for your valuable furnishings and carpet – you gain improved control over the interior room environment. For a free quote on any Motorized Shade job feel free to fill out our Free Estimate Request Form. Please visit our Motorized Shade Gallery for samples of our work.